Pope Francis is today celebrating his 77th birthday and to mark the occasion he will welcome his favourite football team, San Lorenzo, to the Vatican. The Buenos Aires football club, which the Pope has supported since he was a boy, recently won the Argentine league title and a six-person delegation from the club, including players and members of the management team, are bringing the trophy to Rome to show the Pontiff, according to Bloomberg News. Reports suggest the meeting will take place tomorrow. “We’re going to offer him the trophy as he is the world’s most powerful man, we’re proud and excited for the trip,” said San Lorenzo manager Bernardo Romeo ahead of the trip. As part of a low-key celebration of his 77th birthday, Pope Francis celebrated morning Mass and had breakfast with three people who live on the streets near the Vatican, the Catholic News Service reports. A small dog, belonging to one of the homeless men, was also on the guest list. The Pope requested that the daily morning Mass held in the chapel of the Domus Sanctae Marthae be attended by the staff of his Vatican residence “in order to create a particularly family atmosphere for the celebration,” the Vatican press office said in a written statement. 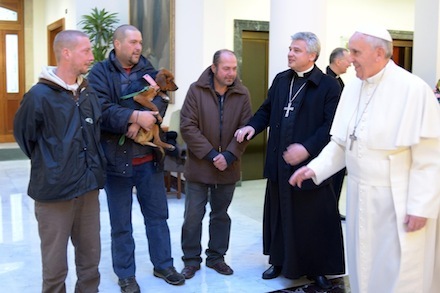 Archbishop Konrad Krajewski, the papal almoner, also invited the three homeless men to the Domus for the Mass and to greet the Pope. In addition, Cardinal Angelo Sodano, dean of the College of Cardinals, represented the world’s cardinals at the Mass, and Archbishop Pietro Parolin, Vatican Secretary of State, attended. All those present sang “Happy Birthday” to the Pope, the Vatican statement said, and then joined him for breakfast in the residence dining room. According to Catholic News Service, a number of Vatican offices paid homage to the Pope in different ways: the Vatican television centre created a special video of visual highlights of Pope Francis’ nine-month-long pontificate while the Vatican internet office posted an e-album of images and quotes by the Pope to their website. A group of children receiving assistance from the Vatican’s St Martha Dispensary, a maternal and pediatric clinic, had given the Pope a surprise birthday party marked with singing, a cake with candles and a sweater as a gift on Saturday. Pilgrims gathered for the Angelus prayer in St. Peter’s Square on Sunday also sang “Happy Birthday” as they waited for the Pope to appear at the window of the apostolic palace. After being named Person of the Year by Time Magazine last week, Pope Francis has now been given the same accolade by gay rights magazine The Advocate. The cover of the December issue of the magazine features a picture of the Pope with a “NO H8” tattoo photoshopped onto his cheek. The image is accompanied by one of Francis’s quotes, “If someone is gay and seeks the Lord with good will, who am I to judge?”. The New Yorker magazine has also featured Pope Francis on its cover with its latest edition bearing a cartoon depicting the Pope lying down in the snow.